The mission of the Edward C. Smith Civic Center is to offer and support activities that enrich community, culture and the arts. 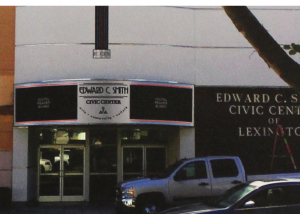 The Edward C. Smith Civic Center is getting a new marquee! This digital marquee will still retain the look and feel of the old Carolina theatre, but with the added safety and convenience of a digital display. Click on the photo below to read the article from The Dispatch. 06/23/2018 @ 3:00 pm - 7:00 pm - Dance Recital!